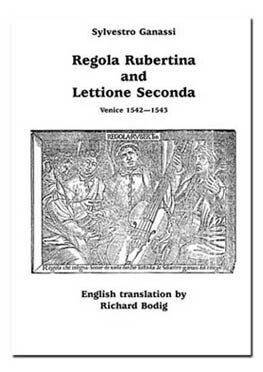 Ganassi's famous treatises Regola Rubertina and Lettione Seconda were the first publications to address the issue of how to play the viola da gamba, which at the time was a relatively new instrument. It is an extremely important book for both players and musicologists, and reveals far more than just how to play. Ganassi was a wise old man, and his attitudes to music and his world and his gentle advice are useful today. 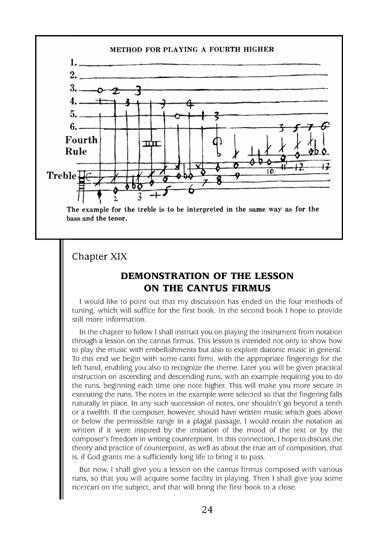 The book covers how to hold the instrument and bow, how to tune each size of viol, tell a good string from a bad one, some music theory, how to read his tablature (which is very complex but most revealing). He also wrote several ricercars (pieces) to illustrate his points. This book is a must for anyone wishing to know about 16th century musical practice, and how to play the early viola da gamba.